The UN verification and monitoring mission published its latest monthly report (PDF). 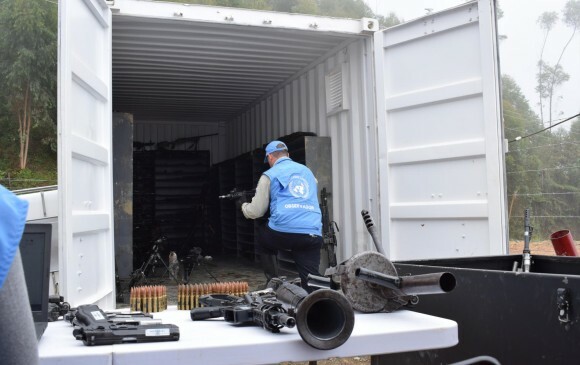 It found that Colombia’s government has finally built most guerrilla disarmament sites, after months of delays. It reported having extracted 94 FARC arms caches around the country. Almost 900 more remain in remote areas around the country. The UN has information about approximately 660, including the 94 that the mission has emptied. Colombia’s Interior Ministry reported a drop in murders of social leaders and activists since April. Colombia’s human rights ombudsman counted 52 such murders during the first six months of 2017. The Prosecutor-General’s office said that 51 percent of cases since 2016 have been “clarified”—a claim human rights groups rejected. On Friday Héctor Mina of the Marcha Patriótica, a leftist political movement, became the latest victim. Four assassins shot him in the center of Guachené, Cauca. The UN mission issued an “urgent call” on the government to release FARC members who remain in Colombian prisons six months after passage of an amnesty law for political crimes. FARC leader Jesús Santrich ended up in intensive care after an 18-day hunger strike to pressure for prisoners’ release. Colombia’s government and leaders of the ELN guerrillas will launch a third round of talks next week. The stated goal is to arrive at terms for a ceasefire (which the ELN wants) or a full cessation of all hostilities (which the government wants). The round is to continue until just before Pope Francis’s scheduled September 6 visit to Colombia. The Ideas for Peace Foundation published a very detailed mapping of Colombia’s current and upcoming organized crime and “armed saboteur” groups. The New York Times published a largely optimistic assessment of Colombia’s post-conflict coca substitution effort in Putumayo, where the FARC appear to be cooperating. The UN Office on Drugs and Crime published its detailed annual report documenting coca cultivation in Colombia in 2016 (PDF). It found a 52 percent increase in the crop over 2015.